Since childhood, Eddie Nashton used puzzles to beat his opponents, habitually cheating to ensure that he would win. He began his life of crime as a simple con man. Yearning to make bigger money, "E. Nigma" created the identity of the Riddler and adopted a unique approach to crime: providing clues to his capers in the form of puzzles and riddles. 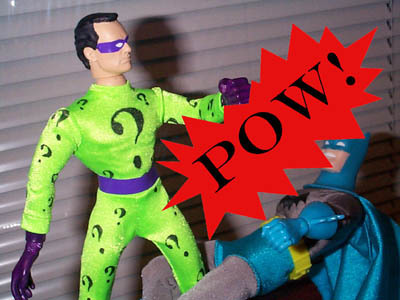 After numerous defeats at the hands of the Batman, the Riddler is now completely obsessed with proving that he is Batman's intellectual superior. 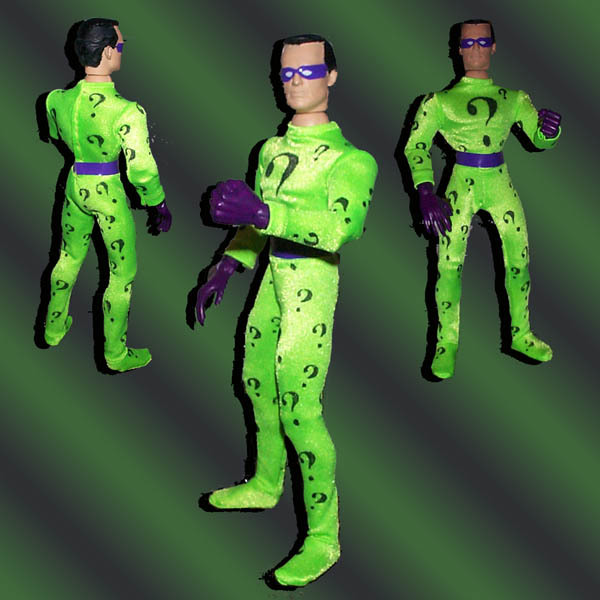 The costume is based on the old Mego Riddler. I used an ink-stamp technique to make the question marks that my wife came up with. I printed out some nice looking question marks, and glued them to some craft foam. I then carefully cut on the craft foam, and glued it so a small block of wood. After sewing a green costume, I took some small pieces of cardboard and worked them under the suit to stretch it a little, and to make it lie flat. I then used a permanent marker to ink up the foam, and pressed it to the suit. I frequently moved the cardboard around so I could apply the stamps at various locations and angles. I used two sizes of small question marks, and one big one for the chest. I'm very pleased with the end result, as it looks very uniform. If I had attempted to draw them in by hand, it would of had a much more home-made look to it. He uses a Famous Cover type 1 male body. The head came from a 9" Star Trek alien, Bele (the guy with half his face white and the other half black). Bele was played by Frank Gorshin, who also played the Riddler in the campy Batman TV show from the 60s. 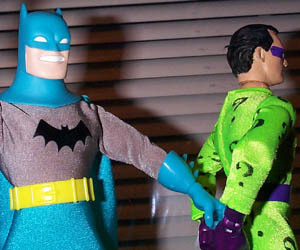 Unfortunately, Bele was a very solemn character as shown in the figures expression, where the Riddler was manic. Oh well.